Richard Soutar, Ph.D., BCN, New Mind Academy, Roswell, GA.
John Hummer, Ph.D., BCN, James H. Quillen VA, Johnson City, TN. Michael R. Sutherland, Ph.D., Dept. of Mathematics and Statistics, Univ. of Mass., Amherst, MA. Correspondence concerning this article should be addressed to Dr. George Lindenfeld, Glenhouse Drive GL-327, Sarasota, FL 34231. We report the results of a pilot study of Reconsolidation Enhancement by Stimulation of Emotional Triggers (RESET Therapy) consisting of 4 sessions with eight combat veterans. RESET involves identifying the components of an auditory binaural beat (frequency, offset) for each, followed by brief imaginal sensory exposure to the traumatic memory (target). This takes place while the binaural beat is playing through headphones. Following a 5-minute challenge trial associated with subjective units of distress reduction (SUDS), each veteran underwent three subsequent RESET sessions (target exposure paired with the binaural beat) lasting 15 to 20 minutes. Whereas all eight veterans met DSM-V criteria for PTSD at pre-treatment (as assessed via CAPS-5 Interview), only one veteran continued to meet PTSD criteria (cut score above 33) by post-treatment. Pre-treatment and post-treatment brain maps were subject to comparison using the NewMind Compare tool. Percentage ‘normalization’ scores ranged from Low/Marginally Average to Above Average across the eight veterans. This finding held for both the Default 1 and 2 comparison and Trigger 1 and 2 comparisons. The findings are discussed relative to current neuroscientific understanding of factors interfering with memory reconsolidation (Nader, Schafe, and LeDoux, 2000) and transformational therapies (Ecker, Ticic & Hulley, 2012). RESET Therapy offers a compelling therapeutic adjunct to the practicing Biofeedback/Neurofeedback clinician, who is under constant pressure to deliver interventions that are rapid, tolerable, and cost-effective. It allows the client to process trauma rapidly and nonverbally without disclosure of the content and spares the therapist from repeated exposures to the raw limbic activity of traumatized clients, thereby minimizing vicarious traumatization, burnout, and compassion fatigue. The movie, ‘First Man,’ currently playing in theaters, tells us about the challenges experienced by astronaut Neil Armstrong and his role in the Apollo space program of the 1960s. The film brings back some of the awe, tremendous excitement and optimism of those days. The success of the Apollo missions was made possible by the powerful Saturn V rocket used to propel the payload (command and service modules, lunar module) out of earth’s orbit so that the astronauts could focus intently upon attending to and completing the primary mission. The Apollo missions fueled the imaginations of the next generations, including those of us who chose careers in neuroscience. This cosmic metaphor helps to describe our view of the potential of the RESET Therapy method to augment the success and broader applications of biofeedback and neurofeedback. These are wonderful technologies that we firmly believe in and have committed our professional careers to. Practitioners in the field are painfully aware of the many dropouts from treatment, partly because of expectations (whether realistic or unrealistic) of rapid symptom relief. Private pay is the norm; insurance companies remain unwilling to pay for 20 to 40 sessions of neurofeedback treatment. The biofeedback and neurofeedback practitioner remains under tremendous pressure to generate rapid beneficial results. Veterans with PTSD (with or without TBI) present an especially difficult challenge. Trust issues, together with compromised prefrontal cortex, become barriers to effectively regulating emotions and seeing beyond the immediate future. Our observed rapid remediation of combat-incurred PTSD re-engages the prefrontal cortex (reasoning, planning, understanding) and establishes the basic trust that motivates the veteran to continue in their biofeedback and neurofeedback treatments. Suffice it to say that following remediation of PTSD symptoms, the veteran’s brain still needs a rebalancing of normal asymmetry and stabilization/regulation of thalamocortical, limbic and brainstem circuits. Integration of the remediated traumatic memory into one’s personal identity to derive new meaning allows a new sense of purpose and future, as opposed to being stuck in the moment. Biofeedback and neurofeedback have essential roles to play in the longer-term therapeutic process. This article aims to introduce RESET Therapy to the clinical practitioner and describe our exciting preliminary findings from a pilot study with combat veterans whose experiences range from Vietnam to Iraq/Afghanistan. RESET Therapy delivers transformative results with combat-incurred PTSD, with or without comorbid TBI! It also operates in a very different manner than other biofeedback/neurofeedback interventions as the subjective experience is qualitatively different. When performed competently (which requires training), the results of RESET are immediate. Collectively, we as biofeedback and neurofeedback practitioners are challenged to substantiate the ‘burden of proof’ so that biofeedback and neurofeedback may finally become mainstream practices within the VA and DOD as well as our society in general, instead of having the field drift into history as abandoned and neglected stepchildren. The default provider of services for veterans is the V.A. Healthcare System. Unfortunately, many veterans avoid the VA, viewing it as an impersonal bureaucracy fraught with confusing or mixed signals. VA Primary Care Physicians with heavy caseloads quickly screen for PTSD, and the skeptical veteran is unlikely to disclose personal vulnerabilities to an untested physician unless necessary. If the veteran marginally meets diagnostic criteria for PTSD, he or she is offered verbal, psychoeducational-oriented ‘evidence-based therapies’ (EBTs), such as Acceptance and Commitment Therapy (Hayes and Smith, 2005) or in the case of a co-morbid addiction in remission, Seeking Safety (Najavits, 2001). For the veteran who meets PTSD criteria, the ‘first-line’ interventions offered are Prolonged Exposure Therapy (Foa, Hembree, & Rothbaum, 2007) and Cognitive Processing Therapy (Resick, Monson, & Chard, 2016). In a minority of cases, a recently approved second-line intervention called Eye Movement Desensitization and Reprocessing (Shapiro, 2017) may be offered. Two recent evaluations of current PTSD therapies (psychological and medical) spanning a broad range of studies were conducted by panels of academic researchers, offering recommendations ‘based on the strength of the evidence.’ One panel convened to provide consensus recommendations to the U.S. Department of Health and Human Services (Forman-Hoffman et al., 2017). The other panel convened to offer guidelines for PTSD intervention to the American Psychological Association (Curtois et al., 2017). PE and CPT (which originated in academia) were rated near or at the top of the recommended list, whereas EMDR (which originated from a serendipitous observation) was placed in a secondary or conditional preference. Steenkamp et al. (2015) reported in JAMA (Journal of the American Medical Association) a meta-analysis of the methodologically most-rigorous studies with traumatized veterans involving PE, CPT, versus non-exposure control interventions (e.g., meditation; waiting list controls). In this realistic analysis, 60% of PE and CPT ‘outperformed’ waiting list and treatment-as-usual controls demonstrating a 10 to 12-point score decrease on the CAPS interview. Though statistically significant, the ‘clinical significance’ of this finding is debatable when one considers that 2 out of 3 veterans in the studies continued to meet diagnostic criteria for PTSD following the interventions. PE and CPT were deemed ‘marginally’ superior to non-exposure-based trauma interventions (e.g., mindfulness/meditation). The authors make mention of the disproportionately high dropout rates in PE and CPT, but reasons for premature termination were not explored in any depth. Now entering its third decade, EMDR enjoys considerable popularity among therapists outside the VA system. EMDR proponents maintain that the method comports well with neuroscience findings of mechanisms of trauma and trauma remediation (Bergmann, 2010) although the central mechanism(s) of action in EMDR remains far from clear or agreed-upon. A recent neuroimaging study (de Voogd et al. 2018) reported that saccadic eye movements activated cortical areas (frontally/pre-frontally) that suppressed fear-related amygdala activity during recall of traumatic memory. This finding was not specific to saccadic eye movements. A working memory task (cognitive-behavioral technique) also resulted in cortical suppression of the amygdala-based fear response. Neither approach was deemed to be superior or inferior to the other. The veteran limited in emotive self-expression (emotional vocabulary) and uncomfortable with self-disclosure (revealing one’s vulnerabilities in writing) is likely to be handicapped by the verbal or written story-telling mandates of PE and CPT. Pressuring a veteran to do something unfamiliar and uncomfortable can lead to an overt or covert reaction of shame and humiliation akin to stuttering and feeling inept. If not handled delicately and supportively, this intervention may be experienced as an attack on personal integrity and dignity. Treatment dropout may not necessarily reflect difficulty tolerating emotional duress alone. It may also involve, at its core, trust issues and exposure of one’s vulnerabilities while one feels exposed and incompetent. Veterans who trust their military commander and peers endure all kinds of pain and suffering if they are valued and respected as part of the team/family. A key discovery that occurred in 2000 found that fear memory is not permanently etched indelibly in long-term memory as previously thought. Each time a fear memory is reactivated, it is then reconsolidated and restored in the amygdala and hippocampus. Nader, Schafe, & LeDoux (2000) found that disrupting protein synthesis in the amygdala by using an old antibiotic medication interfered with reconsolidation of the memory after retrieval. The finding that once a fear memory is reactivated, it becomes vulnerable to modification during a brief window before reconsolidation, was a game-changer! Ecker, Ticic & Hulley (2012) discussed the implications of new ‘transformative’ therapies, relative to existing ‘counteractive’ therapies. Counteractive procedures including extinction and cognitive-behavioral strategies, seek to prevent the symptom from emerging by arranging for a more desired state to occur instead. Examples include teaching relaxation to counteract anxiety or building up resources and cultivating positive rational thoughts to counter automatic depressive ones. Extinction methods are suppressive. They compete against unwanted learning by building up preferred learning and developing responses intended to over-ride and contain the undesirable reaction. Unfortunately, this response remains free to re-occur, so a continuing counteractive effort is typically required (repeatedly and perhaps even indefinitely). Extinction is quite imperfect, and while some targeted emotional and behavioral responses may cease, other emotional and behavioral responses may be re-evoked or re-triggered in certain unforeseen circumstances. The suggestion here is that deletion or elimination of the original implicit memory may not be realistically achieved as intended. (Ecker, et al., 2012a). RESET Therapy is to be considered a transformational method which purports that traumatic memory circuits have a unique frequency that is different from normal memory circuits. This trauma frequency requires identification and access to instigate the process of altering the memory reconsolidation process. RESET Therapy uses a commercially available instrument called the Bio-Acoustical Utilization Device (Lawlis, 2006) capable of producing a binaural beat that is the vehicle for memory change. Once the trauma ‘frequency’ has been identified, an offset frequency (binaural) is adjusted to where it subjectively causes trauma target-related sensations to fade or diminish. About 10% of patients show no effect. In these cases, Lindenfeld does additional interventions (g., with dissociated patients, he may use brief sessions of EMDR to stimulate affective responsivity). Moreover, side effects are temporary and tolerable (e.g., lightheadedness, spaciness, drained-feeling, post-adrenalin jitters, vivid dreams). In hundreds of cases, Dr. Lindenfeld has had only one individual pull off the headphones exclaiming that the sound was intolerable and abruptly exited the session. When panic attacks have occurred, a special setting of the BAUD is utilized to produce a calming effect. QEEG changes (pretreatment to posttreatment) will reflect improvement toward normalization that parallel those obtained with a successful brief course of neurofeedback (percentage normalization expected with 15-20 effective sessions of Neurofeedback). Post-treatment reassessment (repeat CAPS-5; repeat QEEG) and debriefing. The trial protocol was approved by The Institutional Review Board (IRB) of The QuietMind Foundation (QMF). This board is authorized by the U.S. Department of Health and Human Services (DHHS), Office for Human Research Protections (OHRP), IORG 0004684 and IRB 0005585. Written informed consent was obtained for each participant before involvement in the study. Veterans were recruited from community-based organizations including the Sarasota County Veteran’s Commission, newspaper articles published in the Sarasota Herald-Tribune newspaper, and veteran membership organizations in the Sarasota, Florida region. The clinical evaluation (used for trial eligibility) consisted of an initial diagnostic intake wherein the potential participant presented with his/her DD-214 which substantiated honorable discharge from military service. Additionally, substantiation of the diagnoses of Post-Traumatic Stress Disorder (PTSD) by a qualified licensed mental health professional was required. Exclusion criteria consisted of a) severe brain injury inhibiting speech, writing, and purposeful actions; b) the presence of a major psychiatric disorder such as psychotic ideation concurrent to symptoms of psychological trauma; c) active engagement in substance abuse; d) a medical condition such as Tinnitus that, in the judgment of the principal investigator, might place the individual at risk because of a potential adverse reaction. Three groupings consisting of prior combat-involved veterans from three eras were established including Vietnam (1961-1975); Gulf Wars (1990-1991); Iraq/Afghanistan (2001-present). The final sample consisted of two Vietnam Veterans, three Gulf War veterans and three Iraq /Afghanistan era combat veterans. Half of the veterans (N = 4) were identified as having probable comorbid mTBI conditions, based on the Neuroguide ‘Discriminant’ function analysis (developed by R. Thatcher, Ph.D., Applied Neurosciences, Inc.) No payment or mileage allowance was provided for participation in the research project. Reconsolidation Enhancement by Stimulation of Emotional Triggers is an experimental procedure based on the use of a neuromodulated sound (binaural beat). It is a non-invasive intervention that utilizes brief exposure therapy combined with acoustical neuro-stimulation. The goal of this intervention is to rapidly modify emotionally-based memory circuits in the brain to relieve targeted symptoms. The veteran is encouraged to maintain a stance of skepticism throughout the procedure until he/she has experienced an outcome considered to be worthy of continuing to additional sessions. RESET therapy sessions were provided by the primary author (Lindenfeld, G., Ph.D.) for all participating veterans. The Bio-Acoustical Utilization Device (BAUD), developed by Lawlis, F., Ph.D., was FDA approved as a class 2 accessory medical device (Biofeedback device 21 CFR 882.5050) on October 05, 2006. It is designed to boost brain plasticity through a special form of audio biofeedback. The BAUD is a handheld device with sound provided through a set of headphones. It has independent volume controls for the left and right ears. It also has a tone (frequency) knob to adjust the sound frequency as well as a “disrupter” adjustment (offset) knob which produces a sound in the left ear that is different than that provided in the right ear. As part of the study, selected veteran participants were assessed by a certified, doctoral-level psychometrician, who administered the Clinician-Administered PTSD Scale for DSM-5 (National Center for PTSD, Updated 2018), past month version. The CAPS-5 is a 30-item structured interview corresponding to the DSM-5 diagnosis for PTSD. It is considered the ‘gold standard’ in PTSD assessment. Administration of the CAPS-5 requires identification of an index traumatic event (target) to serve as the basis for symptom inquiry. In addition to covering twenty DSM-5 symptoms, questions target the onset and duration of symptoms, subjective distress, impact of symptoms on social and occupational functioning, improvement in symptoms since a previous CAPS administration, overall response validity, overall PTSD severity, and specifications for the dissociative subtype (depersonalization and derealization). As with previous versions of the CAPS, CAPS-5 symptom severity ratings are based on symptom frequency and intensity (except for amnesia and diminished interest which are based on amount and intensity). CAPS-5 items are rated with a single severity score in contrast to previous versions which required separate frequency and intensity scores. The assessor combines information about frequency and intensity of an item into a single severity rating with a total peak score of 80 possible. The minimum cutoff score to diagnose PTSD is 33, although scores in the PTSD range often reach as high as 65 and above. All eight combat veteran participants met criteria for PTSD on the CAPS-5 interview resulting in 4 veterans with PTSD, and four veterans with combined PTSD/TBI. Upon completion of the psychometric assessment, an appointment was scheduled for a Quantitative EEG (QEEG) conducted by George Rozelle, Ph.D., QEEG-D (Diplomate in QEEG). A 19 channel EEG was recorded using a fitted electrode cap containing surface electrodes and linked ears, assessing standard International 10-20 sites. Signal amplification and processing were accomplished with a J & J Engineering (Poulsbo, WA) I-330 C2+ Amplifier, with modifications for the Mind-Brain Training Institute, running Physiolab USE3 software, and using one or more of five investigator-selected mTBI protocols. All devices used in this investigation had been factory-calibrated within the previous three months. Eyes-closed resting EEG (Default State) was recorded for five minutes as a pre-treatment baseline. Next, with eyes closed, the veteran was asked to focus attention upon the selected combat-related trauma utilized as a target for the CAPS-5 interview. This state replicates the ‘activate the target’ component of the RESET procedure. Hence, an eyes-closed baseline (Default state) and an eyes-closed Trigger condition (trauma network activation) were obtained to be utilized as a pre-treatment baseline. Follow-up occurred after four RESET therapy sessions with the psychometrician providing another administration of the CAPS-5 interview. Post-treatment results revealed that seven of the eight veterans had fully remitted PTSD (CAPS-5 total scores below 33) via the second CAPS-5 interview. The veterans were then reassessed with QEEG in the eyes-closed (resting state/default), and the activated PTSD ‘trigger’ conditions. III. QEEG DATA PROCESSING: Raw EEG datafiles (EDF files) were submitted to an auto-artifacting procedure via Neuroguide software, which is an FDA-registered database of normative qEEG values. Four raw EEG datafiles taken from each participant in the eyes-closed state were artifacted. Artifact refers to any error introduced by the participant such as eye blink or muscle tightening that distorts the recorded data. The data files included Default Mode Network (DMN) recordings that occur when the mind is in a quiet or non-focused state as well as a trauma activated and focused state. Thus, the four measures include the Default 1 (default state at pre-treatment); Trigger 1 (activate PTSD trigger at pre-treatment), Default 2 (default state at post-treatment); Trigger 2 (activate PTSD trigger at post-treatment). These data files were sent to J. Hummer, Ph.D., BCN (Licensed Clinical Psychologist, BCIA-certified, Neurofeedback). With the assistance of Dr. Richard Soutar and NewMind staff, EDF files were further reviewed for artifact (submitted to the auto-artifacting tool of the NewMind system). One datafile emerged through this process that required manual artifacting. These processed EDF files underwent conversion into Bioexplorer CSV files (providing descriptive statistics, site by site, on dimensions such as total amplitude, dominant frequency, asymmetry, phase, and coherence). CSV files were then entered into the NewMind Expert QEEG database which yielded topographical head maps for each veteran in the afore-described conditions. The head maps generated by the NewMind system topographically depict data for nineteen 10-20 sites. Finally, the NewMind compare tool (the only of its kind among current QEEG /neurofeedback professional systems) was used to contrast Default 1 versus Default 2 and Trigger 1 versus Trigger 2 material. Each QEEG brain map topographically presented information about the above-described dimensions spanning the Delta (1-4 Hz. ), Theta (4-8 Hz. ), Alpha (8-12 Hz. ), Beta (15-20 Hz.) and High Beta (20 – 30 Hz.) frequency bands. 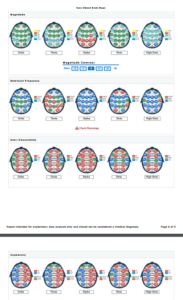 QEEG maps for Default 1 versus Default 2, and Trigger 1 and Trigger 2 conditions for each veteran may be found in the Appendix. This section has been provided to assist those readers unfamiliar with QEEG processes and terminology to understand better the brain map material provided within the article. The earliest efforts at developing normative databases involved researchers affiliated with large universities and medical centers where research funding and collaboration with other disciplines was possible. E. Roy John ( 1977) was the first to establish a large normative population database. Z scores were selected to provide standardization where the population mean is set at 0, and divergence from the norm measured in positive and negative standard deviation (SD) units. When grant funding began to ‘dry up,’ the privatization of normative databases occurred. Consequently, the development of a representative database took years and millions of dollars to complete. To recoup their investments, researchers had to adopt an entrepreneurial role by developing the means to charge fees for access. Tansley, et. al., (1994) came up with a color scheme and topographical display for conveying how well an individual data set comported with the normative data. The color scheme has since become a standard among QEEG databases. Perhaps the best known and researched QEEG topographical mapping system is that of Robert Thatcher, Ph.D. (Applied Neurosciences, Inc.). Dr. Thatcher worked with E. Roy John at New York University during the development of NxLink. He later developed Neuroguide while employed at the University of Maryland by collecting normative data on a broad population of individuals including mild, moderate, and severe TBI patients. Raw EEG data is collected via hardware and specialized software programs and then stored in datafiles. Artifacts (false readings caused by non-brainwave sources, such as eye and muscle movements) are removed from the data. The artifacted file is then inputted to a computerized commercial data analytic program which analyzes the data according to the proprietary statistical norms. The color-coded product of this process is an output map, also referred to as a topographical map, which displays the range that each relevant score falls within. The 10–20 system is an internationally recognized method to describe and apply the location of scalp electrodes to examine the EEG for diagnostic or treatment purposes. This method was developed to maintain standardized testing methods ensuring that a subject’s study outcomes (clinical or research) could be compiled, reproduced, and effectively analyzed and compared. The system is based on the relationship between the location of an electrode and the underlying area of the cerebral cortex of the brain. Through convention, odd numbers represent left-hemispheric sites. Even-numbers sites are right hemispheric, and there are several midline sites each with “z” as a secondary label. The sites vary by lobe including the prefrontal, frontal, temporal, parietal, and occipital regions. The dimensions of amplitude and frequency describe the intensity and speed of brain activation. Amplitude is recorded in microvolts at the scalp’s surface and can be thought of as an activation or accelerator function. In contrast, Frequency can be thought of as the intensity indicator of the brain which ranges from lowest to highest cycles per second also referred to as Hertz (Hz.) levels, as follows: Delta (1-4); Theta (4-8); Alpha (8 to 12); Low Beta (13 to 15); Beta (15 to 20); High Beta (20 to 30) and Gamma (40 to 120). Gamma is very difficult to reliably measure as it tends to be confounded with muscle artifact and it is not typically analyzed as part of the QEEG. In clinical populations, low voltage (power) EEGs are quite common. When present, this seemingly reflects the effects of oxidative stress and other factors in diminishing the overall strength of the EEG signal. According to Neidermeyer (2005), “Low voltage records show a high incidence in post-traumatic patients, and ‘psychogenic alpha suppression’ often accounts for the small amplitudes. In the present study, several of the veterans may be characterized as having ‘low power’ maps, and the others have maps falling somewhere between low power and average power. When we describe a QEEG such as that provided in Table 3., we are designating patterns of amplitude (activation) at different sites of the cortex. Topographical maps typically partition data as follows – the varied circles represent the scalp, and within each, the smaller circles represent the 10-20 sites. In the anterior half (front) of the brain, there are prefrontal sites (Fp1, Fpz, Fp2), dorsolateral frontal sites (F7, F8), dorsomedial frontal sites (F3, Fz, F4), anterior temporal sites (T3, T4), and central sites over the sensorimotor strip (C3, C4, C4). In the posterior (rear) portion of the scalp are the posterior temporal sites (T5, T6), the parietal sites (P3, Pz, P4) and occipital sites (O1, Oz, O2). The midline area corresponding to the corpus callosum and the anterior and posterior cingulate gyrus extends from anterior (Fpz, Fz) through central (Cz) through posterior (Pz, Oz). Separate head maps depicting the 10-20 sites across the scalp are displayed for the frequency bands (Delta, Theta, Alpha, Beta, High Beta). When examining the dimension entitled ‘amplitude,’ any site colored in green designates that the microvolt levels are within the normal range found among most people (average range). When the voltage falls one standard deviation below (Z values ranging approximately from -1.0 to -1.99) it is colored light blue, and when it falls one standard deviation higher than average (Z value = 1.0 to 1.99), the site is colored in red. When the voltage value falls two standard deviations below average (Z value = 2.0 to -2.99 or lower) the site is colored dark blue, and when the voltage falls two standard deviation units above average (Z value = 2.0 to 2.99, or higher) the site is colored Yellow. The color scheme for the normative distribution, as used in QEEG, is depicted in Figure 2 (below). The brain does not function at the same speed and intensity all over the cortex. Ideally, if every site were colored green (for a certain amplitude), the brain would be functioning across-the-board in a statistically normal manner. In practice, it is rare to encounter a brain map where the amplitude is uniformly average (green) across all cortical sites, and across each of the frequency bands (Delta, Theta, Alpha, Beta, High Beta). Different parts of the brain prefer certain frequencies to communicate with other parts. When the brainstem sends information to the cortex, it is in the Delta frequency. Hopefully, the amplitude is Average (green), rather than being too high (red, yellow) or too low (light blue, dark blue). The septal-hippocampal area, dealing with memory consolidation and retrieval, and emotion, communicates with the cortex in the Theta frequency. The Thalamus and the Cortex communicate with each other reciprocally in the Alpha frequency. Adjacent cortical sites, or sites involving interneurons, communicate with each other in the faster (e.g., Beta) frequencies. When the High Beta frequency is utilized, there is often some type of compensatory process where the brain must speed up on one area to compensate for a slowing in the contralateral hemisphere. Homologous site pairs (e.g., F3 -F4 or C3-C4) indicate that the same area of one hemisphere is communicating with its corresponding area in the other hemisphere. They are considered cross-callosal pathways. Intra-hemispheric pathways involve sites in the anterior part of the hemisphere communicating with posterior areas of that same hemisphere. Different areas of the brain operate at different speeds. The frontal regions operate at higher frequencies (amplitudes and frequency bands) than the posterior sites. Optimally, the dominant (e.g., left) hemisphere should operate slightly faster than the right hemisphere (usually up to 1 -2 microvolts higher in the Beta range at left hemisphere sites, and Alpha (slower) should be of higher amplitude in the right hemisphere than the left hemisphere. The color-coding scheme means something different when it comes to the dimension of ‘Dominant Frequency.’ For example, “dominant frequency” in the Alpha range refers to the peak microvolt reading occurring somewhere in the range of 8 Hz and 12 Hz. The peak amplitude could be right in the middle of that range (9.5 to 10.5 Hz = Green), or at the lower ‘slow’ end (8 Hz = Dark Blue; 9.0 to 9.5 Hz = Light Blue) or the higher ‘fast’end (10.5 – 11 Hz = Red; 12 Hz = Yellow). QEEG interpretation is a complex process that takes training and experience to grasp. From the map material alone, we are bringing together information about frequency, amplitude, and brain location and function. Additionally, we can interpret how clinical problems tend to manifest along these dimensions. We bring clinical history and medical history into the interpretation, as well as the effects of medications and recreational drugs/substances and lifestyle factors such as diet and sleep efficacy, which can slow or speed up the QEEG, often diffusely. Some clinical conditions (and subtypes of those conditions) tend to have certain expected QEEG ‘signatures,’ but other conditions are far more complex and do not have a predictable signature (e.g., PTSD, TBI). The interaction of frequency (lower or higher) and amplitude (acceleration) are often expressed via the term ‘activation.’ Neuroimaging research has substantiated a robust parallel between metabolic activity level of brain tissue including the degree of blood perfusion, the rate of oxygen and glucose utilization and greater recruitment of neurons with their cumulative presynaptic and postsynaptic potentials constituting the strength of the EEG signal. Figure 1 depicts changes in CAPS-5 total score values from Pre-treatment (red) to Post-treatment (blue) for each of eight pilot study participants. Only one veteran continued to meet diagnostic criteria for PTSD (score of 33 and above) on the post-treatment CAPS-5. This veteran had concurrent moderate to severe Traumatic Brain Injury (TBI). The remaining seven veterans showed full remission of the PTSD diagnosis after receiving four sessions of RESET Therapy. FIGURE 2. NEWMIND NORMAL DISTRIBUTION CURVE WITH COLOR-CODING SCHEME. As displayed in Figure 2, Z score ranges +/- 1 sigma (green) include the middle 68% of population. At 2 SD, the scores range from 16% to 84%, (+ 2 red/yellow) – 2 (light blue) includes the middle 95% of population – From 2.0% to 98% points, + 3 (red) -3 (dark blue) includes 99.8% of population. In Figure 3. – Magnitude, GW-2’s amplitude of Theta in the temporal and posterior sites is 1 SD below average. At this level, we could hypothesize that short-term memory and sequential memory deficits generate diminished attentional and frustration-tolerance capacity. Sequential memory deficits affecting longer-term memory may be manifested via a fragmented or impoverished verbal narrative of past life experiences, especially aversive ones. There is likely a potential to become confused or overwhelmed (information overload), negatively impacting learning ability (e.g., poor-performance learning on-the-job or in college or vocational training). There is likely to be reduced emotional awareness which may also involve dissociation and emotional numbing. Increased amplitude of Alpha in posterior sites raises the possibility of perseveration and rumination, with insomnia likely. Turning next to the analysis of GW-2’s Dominant frequency, there is a slowing at this level occurring in the Delta, Alpha, and Beta bands. Clinically, we might speculate that problems such as a history of TBI, low Dopamine level, white matter damage or dysfunction, poor functional integration and the possibility of a history of chronic drug use (self-medication). There is also likely to be persistent stress, adrenal fatigue, confusion, reduced cognitive stamina and efficiency, and chronic hyperarousal. The variable termed ‘Coherence’ can be thought of as how strongly two brain sites are communicating with one another. GW-2’s Inter-Connectivity high coherence indicators (hyper-coherence, depicted in red site pairings can be seen along midline site pairs across all of the frequency bands) is a pervasive finding in TBI. Sites in one hemisphere are reaching over to ‘help out’ the dysfunctional hemisphere by giving it resources thereby aiding its healing and adaptation process. When Site A has to share its resources with Site B, then Site A no longer has enough resources to perform its independent functions. The long-term survival mission is to bolster fewer but shared functions of both hemispheres, to try to help the dysfunctional site toward eventually getting itself back online. The consequence of this compensatory activity is that the two sites become ‘enmeshed’ with each other. With neither site able to perform its full range of functions independently, the range of available functions is restricted. The behavioral manifestation of hyper-coherence is inflexibility and rigidity, both cognitively and emotionally. Lower flexibility means lower tolerance for stress, and reduced behavioral repertoire for handling new, challenging, and stressful situations. Turning next to GW-2’s Asymmetry dimension by examining left vs. right hemispheric differences, particularly in the Alpha and Beta bandwidths, it can be observed that Beta activity is above-average (red) in the right hemisphere, but below average (blue) in the left. By contrast, Alpha activity is above-average in the left hemisphere, and below average in the right. This is the inverse of how the brain should be functioning. Work by Davidson (1995; Silton, Heller, et. al., 2011) have aptly demonstrated that left hemisphere slowing is indicative of clinical depression with accompanying diminished approach and appetitive behavior, severe restriction of positive affect and reward motivation, an exhaustion state of resource depletion, diminished judgment and problem-solving, and indecision, etc. Right hemisphere overactivation suggests severe anxiety, persistent hyperarousal, fear-based avoidance, social retreat, panic attacks, inability to relax, persistent sympathetic hyperarousal, difficulty controlling emotions such as fear and rage, etc. Overall, the QEEG findings appear quite consistent with the veteran’s history of PTSD and TBI. This constitutes the veteran’s default or resting state, before treatment. 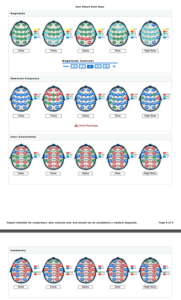 The NewMind Expert QEEG system, developed by Richard Soutar, Ph.D., (2011) is unique in that it is the only QEEG system available that contains a ‘map compare’ tool. This allows comparisons of any two given QEEG maps across twenty-one 10-20 sites on five dimensions: total amplitude, dominant frequency, asymmetry, phase, and coherence. Assessment of change involves analysis of two co-occurring yet seemingly contradictory dimensions: movement away from the population mean (compensatory processes); movement toward the mean (normalization). Any time there is new learning occurring, the brain rearranges itself. This process does not occur linearly, and indeed, the activity may seem chaotic at times. Within this context, brain plasticity can be positive (adaptive) or negative (maladaptive). For example, an individual with brain damage from exposure to trauma likely has too low a level of plasticity. This may be understood as an inability to adapt to changes rapidly in a normative direction. In general, we would like a healthy balance of change towards normalization via compensatory processes (moving things around to accommodate the change). When the brain map first evidences change, such as that which occurs through neurofeedback training, there tends to be more compensation occurring. With continued treatment, we anticipate increased normalization with the diminishment of compensation variables. Hence, when an intervention produces adaptive symptom changes, the brain map changes toward normalization in steps or cycles. That is, each statistically normal 10-20 site does not remain normal while the other sites move in the direction of normalization. All 10-20 sites locations may be subject to changes at any point in time as part of the brain’s neuroplastic reorganization processes. The brain must continually reorganize to accommodate new changes whether they be healthy or unhealthy. This accommodation is called compensation. Specifically, this refers to the shifting around of resources (temporary sacrifice) for the greater long-term good of the whole (normative functioning). To be able to accommodate movement of regional frequencies toward a more normative range of activities, other regions may need to move away from the norm to compensate for the change. Re-organizational accommodation may occur in one neurometric dimension to offset changes in another. Coherence (meaning degree of intra-brain communication) is primarily considered to be an accommodating neurometric dimension. This dimension may increase or decrease between large-scale networks depending on the local and regional load demand. This magnitude shift variable also represents changes in mitochondrial energy levels. As the brain operates in a critical state on the border of chaos (Soutar, in press), it is impossible to predict the trajectory of the accommodation process. The best measure of change following a typical course of neurofeedback is symptom change, together with a 30% to 40% change toward normalization via a comparison of two consecutive brain maps. 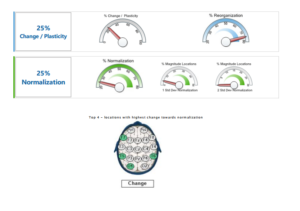 Through the use of the NewMind map comparison tool, the following percent change norms may be used as a rough guide measuring the degree of progress toward normalization after 20 to 40 neurofeedback sessions. Average change: 30% to 40% change. High change: 40% to 50% change. Within the context of a positive response to a particular treatment intervention, we would expect a positive self-report via the CAPS-5, or an equivalent measure of symptom reduction. The use of the QEEG brain map is a relatively new development in correlating symptom changes. With successful treatment, we would expect the brain to become more efficient. One way of assessing that efficiency is when the default state begins to function more like that of normal individuals without neurologic or psychiatric problems. The NewMind system incorporates normative data from normal populations, peak performers, and clinical populations via a sophisticated, evidence-based algorithm. Through this analysis, we can gauge how well the person is functioning by their statistical improvement in the direction of normality. Neurologic research on brain lesions and neuroimaging research on healthy (versus unhealthy) performance localized to specified brain regions have been used to cross-validate and substantiate the statistical findings obtained on QEEG brain maps. Also, neuropsychological and psychological measures provide further referential material. Figure 4 (below) depicts the Default state of veteran GW-2, following 4 sessions of RESET therapy. The Compare Map (topographical map of depicting the post-treatment Default state and identifying specific 10-20 sites that have significantly changed statistically from pre-treatment to post-treatment) for veteran GW-2 can be found in the Appendix (see Figure 3 for Veteran GW-2). Depicted topographically, changes appear subtle: there was an increase in high amplitude Alpha among posterior sites at post-treatment. This is likely a compensation effect (temporary reorganization) in the occipital sites. We interpret this to be a positive indicator suggesting that our veteran is more willing to visualize situations internally that he previously was unable to consciously create because of their prior level of aversiveness. Increased Alpha in the parietal areas suggests there may be an increase in active rumination such as when one focuses on one’s to-do list. Although speculative on our part, perhaps this is a necessary aspect of integrating trauma into one’s identity rather than repetitively and protectively attempting to shut it out of conscious awareness. A great deal of cognitive processing occurs in the parietal areas. Parietal and posterior temporal sites deal with the personal meaning of experiences. This consists of both verbal and nonverbal processing. Note in Figure 5 (below) that among the 10-20 sites showing the greatest change toward normalization were T5 and T6 which includes the posterior and temporal/ parietal areas as well as C4 and F8. Based on prior neurofeedback research and training, we are aware that sites C3 and C4 tend to have a balancing and stabilizing effect on other sites. These reference points are often used in the neurofeedback protocol to add stability and reduce the negative side effects of training. Hence, C4 may be helping to stabilize much of the right hemispheric (nonverbal-emotional, experiential, sensory) functions. Site F8 tends to deal with lateral frontal nonverbal issues, including visual working memory (improved) and reduced avoidance behavior, as well as improved emotional functioning (healthy and flexible emotional and behavioral inhibition). Alpha asymmetry is noted to have normalized in the prefrontal regions (note that sites Fp1 and Fp2 are now green). This change suggests that the prefrontal areas are no longer hyper-activated. The individual with PTSD who has previously been emotionally constricted and anxious seeks to overcontrol the expression of emotions. This is an automatic compensatory response that seeks to rebalance an overactive limbic system. Figure 5 reveals a 24% change in reorganization (compensatory processes) with a 44% increase toward normalization, indicating that the brain is functioning more efficiently. We next, examined the veteran’s performance in the eyes-closed ‘Trigger the Target’ condition, the state in which RESET sessions were conducted. The pre-treatment Trigger map is quite similar to the pre-treatment Default map, and will not be interpreted or presented here. Please refer to the Appendix to evaluate veteran GW-2’s pretreatment Trigger QEEG (eyes closed) and post-treatment Trigger QEEG (eyes-closed). The Trigger Compare Map (depicting pretreatment versus post-treatment changes) is presented in Figure 3 of the Appendix for veteran GW-2. To summarize, the change in the Trigger (pretreatment versus post-treatment) maps, veteran GW-2 evidenced a subtle shift toward normalization in Delta (site T3). Anterior temporal sites T3 and T4 are the sites of Insula activity – the brain’s interface with the body. The shift toward normalization in Delta at site T3 suggests more normalized and efficient left insular activity. We interpret this change as reflecting reduced bodily hyperactivation/hyperarousal and improved sympathetic/ parasympathetic balance for autonomic nervous system activity. The number of posterior 10-20 sites with high amplitude Alpha increased, but again this may represent a lifting of the (previous) suppression of visual imagery because the imagery is now experienced as less aversive. The increased number of posterior sites with elevated amplitudes of Alpha may also reflect increased rumination (anxious or busy mind), which may reflect the adaptive reorganization process. Consider that the veteran is undergoing a stage of redefining himself and reorganizing his life priorities given that protect/defend/survive is no longer his primary mission. Seemingly, he has new life possibilities and newly available emotional resources to re-invest. Most noteworthy in veteran GW-2’s Trigger map comparison, shown in Figure 3 in the Appendix, is a shift toward normalization in the Beta range of sites adjacent to the midline. This suggests movement toward the brain’s normal asymmetry patterns. Behaviorally, this evidences itself in an increase in positive affect and approach tendencies. As the left hemisphere activates, we would tend to see a reduction in negative affect and avoidance behavior in the right hemisphere. Indeed, asymmetry measures show a change toward normalization of prefrontal sites (Fp1, Fp2) in the Theta, Beta, and High Beta ranges. Consequently, it may be surmised that: executive functioning has improved; working memory including mental focus and endurance has improved; frustration tolerance has increased; rational and critical thinking, problem-solving, judgment and decision making have been augmented; self-centered immersion has diminished, and potential for empathic sensitivity to others has increased. Overall, there was a 25% change in reorganization and a 25% change toward normalization in the Trigger condition for veteran GW-2 which is on the low end of Normal. Sites showing the highest degree of normalization were T5, T6, F7, O1. Posterior temporal sites (T5, T6) deal with existential issues of personal meaning integration of the resolved trauma into one’s life story. Site O1 is the site of highest alpha production, suggesting an improved sense of relaxation and safety in one’s body and surroundings, perhaps even the potential for moments of positive inner reflection and tranquility. Dorsolateral frontal site F7 has a correspondence with Broca’s area, suggesting more efficient verbal communication ability and potential for verbal narrative. We turn our attention now to Default State Pre-treatment versus Post-treatment comparisons for all eight veterans as depicted in Figure 7. Having demonstrated via a case example that CAPS-5 changes toward normalization are accompanied by QEEG site changes trending in the same direction in both the Default Mode and Trigger conditions, we depict the change data across all eight combat veterans. For the reader interested in examining the maps and comparisons in greater detail, the maps for each veteran corresponding to the one presented for veteran GW-2 are presented in the Appendix. Using the QEEG comparison guidelines proposed by Dr. Soutar, we see that two veterans (V-2 & GW-1) showed changes toward normalization above 50%. Three veterans (GW-2, GW-3 & IA-3) showed changes toward normalization between 40% and 50%, and one veteran (IA-2) showed a change rate toward normalization just above 30%. The remaining two veterans (V-4 & IA-1) showed rates of change toward normalization just shy of 30%. Recall that a 30% to 40% change is considered normal regarding what might be expected following a successful initial trial of neurofeedback (e.g., 15 to 20 sessions), so long as there is evidence of concurrent symptom improvement. Viewed from this perspective, these preliminary findings are quite impressive and consistent with CAPS-5 score symptom reductions falling below the clinical threshold in 7/8 cases. 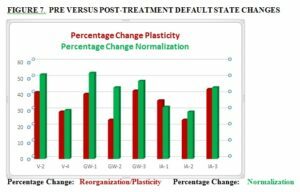 We observe Average to Above-Average rates of change toward normalization in the Default Mode state in 6/8 (75%) of the cases. We see essentially the same pattern of findings in Figure 8., Trigger pre-treatment versus post-treatment QEEGs are compared for the eight veterans. As noted earlier, veterans V-4 and IA-2 obtained change scores toward normalization above 50%. 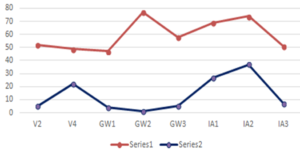 Veterans V-2, GW-1, GW-3, and IA-3 showed changes toward normalization between 40% and 50%. Veterans GW-2 had a score that is marginally normal. Only veteran IA-1 showed a below-average range of normalization in the Trigger condition. We are continuing to ascertain possible reasons for the differences in brain change rates across veterans. Factors such as physical health problems, multiple medications, social problems, and lifestyle problems (with regard to diet, exercise, and sleep patterns) can -whether separately or synchronously – have the effect of reducing plasticity (rate of brain change) in response to interventions. The consistency of the data regarding rates of change toward normalization spanned two related, but slightly different assessment conditions (Default and Trigger states). The similarity of results increases the likelihood that the findings were not merely due to chance. Our clinical premise was bold and simple. 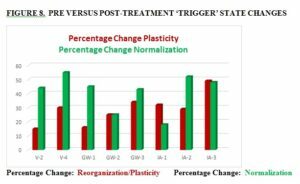 We hypothesized that four sessions of RESET Therapy would result in change comparable to that normally attained via 20 sessions of neurofeedback. Our CAPS-5 changes exceeded those obtained with existing trauma-based therapies. Recall that Steenkamp et al., 2015, found an average of 10 to 12-point decrease on the CAPS-5 in 60% of patients in their meta-analysis of PE and CPT, relative to meditation and waiting list controls. Our average decrease score is 46 points among the eight participants ranging from a high of 76 to a low of 27. Furthermore, in our pilot study, only 1 of 8 veterans continued to meet PTSD diagnosis post-treatment although the outlier veteran had significant symptom reduction. This individual has moderate to severe TBI. Our QEEG comparisons from pre-treatment to post-treatment (Default and Trigger conditions) are slightly more varied in the outcome. Seventy-five percent (75%) of participants showed Average to Above-Average normalization across both the Default compare and Trigger compare conditions. Roughly 25% of patients showed a Below-Average (but approaching Average) percent normalization. The time lapse between pre and post-treatment brain maps ranged from approximately one to two months. We intend to revisit the results of one-year post-treatment to further clarify the normalization effect. Certainly, these are preliminary findings and will require replication with improvements in study design based upon what we have learned (e.g., larger sample sizes, random assignment, blinding of evaluators and raters as much as possible). Use of objective physiological measures is a necessary component of further studies of this kind to complement the more subjective symptom measures. We hold that structured clinical interviews (CAPS-5) are essential; however, alternate forms of CAPS symptom inventories allowing assessment of response style (validity measures) would certainly be of interest. Collateral measures obtained via interview and objective collateral rating scales would be useful as well. For example, a tool such as the ACES questionnaire (Felitti et al., 1998) could help in determining if we are dealing with complicated or uncomplicated PTSD. Similarly, TBI symptom severity measures may be obtained to identify the degree of disturbance in this variable (Meterko et al., 2012.) It would be of immense interest if other researchers would consider using the PTSD Default Mode protocol to ascertain the efficacy of varied treatment approaches. This accomplishment alone would bring consistency and unity to the field. Furthermore, we believe that unless the nervous system is rebalanced, the veteran remains at above-average risk for later problems including cardiovascular and cerebrovascular disease including heart attack, stroke, chronic pain, Parkinson’s Disease, and dementia not to mention a myriad of interpersonal/social/financial problems. Adjunct treatment could focus on reducing those risk factors, using various Biofeedback and Neurofeedback interventions. Sympathetic vs. para-sympathetic balance, normalization of hemispheric asymmetry, and amelioration of focal or regional QEEG abnormalities will still need to be addressed. Successful trauma intervention requires that the trauma effects be integrated into one’s identity and that sleep efficacy and lifestyle habits be improved. With the initial booster effect of RESET Therapy, we perceive that the client will have the capacity to develop trust in the practitioner and become more willing to invest in his/her long-term health and well-being. Courtois, C. A., Brown, L. S., Cook, J., Fairbank, J. A., Friedman, M., Gone, J. P., … Roberts, J. (2017). Clinical Practice Guideline for the Treatment of Posttraumatic Stress Disorder (PTSD) in Adults American Psychological Association Guideline Development Panel for the Treatment of PTSD in Adults Adopted as APA Policy February 24, 2017. Davidson, R. J. (1995) Cerebral asymmetry, emotion, and affective style. In Brain asymmetry (pp. 361–387). Cambridge, MA, US: The MIT Press. de Voogd, L. D., Kanen, J. W., Neville, D. A., Roelofs, K., Fernandez, G., & Hermans, E. J. (2018). Eye-movement intervention enhances extinction via amygdala deactivation. BioRxiv, 282467. Ecker, B., Ticic, R., & Hulley, L. (2012). Unlocking the Emotional Brain: Eliminating Symptoms at Their Roots Using Memory Reconsolidation. Routledge. Felitti, V. J., Anda, R. F., Nordenberg, D., Williamson, D. F., Spitz, A. M., Edwards, V., … Marks, J. S. (1998). Relationship of childhood abuse and household dysfunction to many of the leading causes of death in adults. The Adverse Childhood Experiences (ACE) Study. American Journal of Preventive Medicine, 14(4), 245–258. Soutar, R., & Longo, R. (2011). Doing Neurofeedback: An Introduction. ISNR Research Foundation.